Being in college is stressful. Every college student will tell you that, and if they don't, then they are clearly lying about being enrolled in college and you should probably follow their car in the morning to see where they're really going. You have mounds of work to accomplish in short periods of time. You might have to work to pay for your education. You want to keep your social life in tact. The fact of the matter is that when you're in school, you have serious responsibilities that can drag you down. Add onto that living with strangers and not having a second of private time to yourself, and you'll want to cry. But never fear, there are ways that you can get away of the stresses from school and your roommates. Go for a walk! Go for a run! Just get out of your dorm/apartment as long as the weather is nice. I love getting out and walking down to the waterfront. As long as it's sunny and above freezing, you can find me sitting on the steps near the lake reading and listening to music. People watching is one of my favorite things to do when I have free time. I'll sit on my window sill and watch people come in and out of the buildings. My favorite way to people watch is to sit out in front of the Rock and Roll Hall of Fame. The people who go there and take pictures out front are always so happy. When the weather is really nice, people get their wedding photos done. Earlier in the fall, I once witnessed three different wedding parties getting their pictures taken in front of the Hall of Fame and it made my heart warm. Go out and get yourself a coffee. Curl up in the corner of a Starbucks or your local coffee shop with a book or magazine of your liking. Sometimes just getting out of your room for a while is enough to clear your head. Work out in your fitness center. If the weather isn't nice enough for you to walk outside, go blow some steam off in the weight room on a treadmill or do some sit-ups or maybe yoga is more your thing. 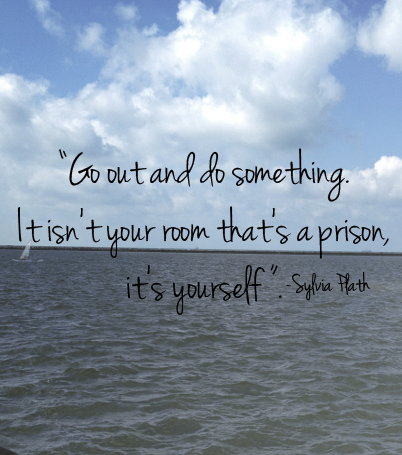 The key is to just escape from the confines of your room for a little bit. Even an hour away from your work and stress at your home can be your saving grace. Contrary to popular belief, you are allowed to take breaks in college. It is not a constant stream of reading text books, finishing lab reports, writing papers, and cramming for your exams. It's original intent was not to stress the living daylights out of students just trying to further their education. If you want a few minutes to yourself to just relax, then take those few minutes. You'll feel better in the long run. Trust me on this one.